Hybrid tea roses, the products of a cross between hybrid perpetual roses and old-fashioned tea roses, are rose royalty. They are the most popular roses in the world and perhaps the most popular flowers. Hybrid teas have all the virtues you look for in a flower: beauty, fragrance, and easy care. Hybrid teas generally produce only one blossom at the end of each stem, rather than clusters of flowers, and they have an open rather than bushy habit. Virtually all hybrid tea roses are repeat bloomers throughout the growing season and offer some degree of fragrance. The flowers on hybrid tea roses may have over 60 petals and can be as large as 5 inches across. A signature of hybrid teas is the long, pointed buds that open by slowly unfurling. Plants will grow anywhere from 3 to 6 feet tall, depending on the variety and the growing conditions. Hybrid teas have been cultivated in almost every color except blue, with many extraordinary bi-colors to chose from. If your rose plants come bare root, remove the packing around the roots and soak them in a bucket of water for at least 2 hours and up to 24 hours. Dig a planting hole large enough to spread out the roots, usually 12 to 18 inches in diameter. As with many cultivated flowers, hybrid teas are bud grafted onto hardy, disease-resistant rootstock. The bud union is the visible knob at the base of the plant. In warm climates, the bud union should be 1 to 2 inches above soil level. In colder climates, bury the bud union 1 to 2 inches below ground level. This union should always be protected in cold winters. Make a cone-shaped mound with soil, in the center of the hole and spread the roots out over the mound. Fill the hole halfway with soil and water well to remove any air pockets. Finish filling with soil and water again. Hybrid teas do best in full sun but will tolerate light shade. However, full sun improves their blooms and general resistance to disease. 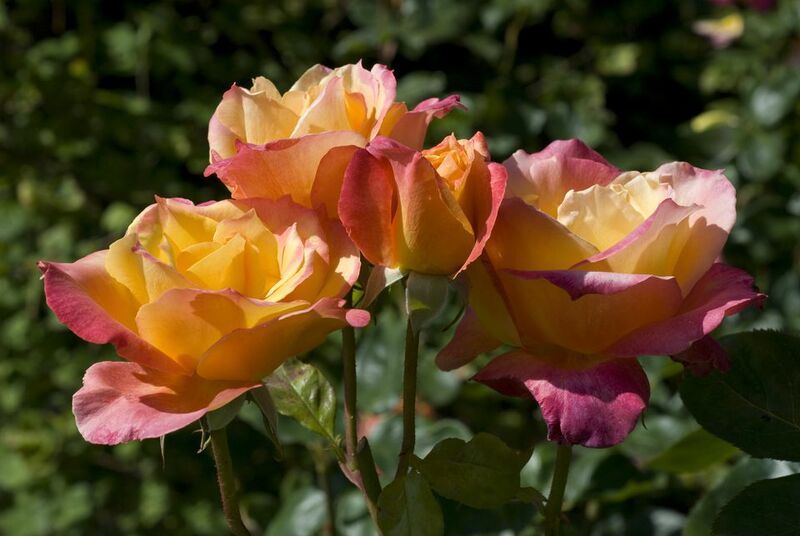 Hybrid tea roses like a slightly acid soil (6.0 to 6,5 pH) that is rich in organic matter. Mulch the plants to cool the roots and conserve water. Add a 3- to 4-inch layer of mulch in the spring, when removing winter protection. In warmer climates, mulch when the leaf buds begin to swell. As with most garden plants, 1 to 2 inches of water per week is usually sufficient, but this varies by climate and growing conditions. Hot locations and sandy soil will need more frequent watering than cool, coastal regions. A simpler rule is to water when the top 3 inches of soil are dry. Water the soil, not the leaves, to prevent disease. Also, water deeply to encourage root growth. Strong, deep roots will help your roses survive periods of drought. Hybrid tea roses, being repeat bloomers, are heavy feeders and benefit from regular applications of fertilizer. Start in early spring, either a month before new growth or when you remove winter protection and continue feeding weekly or every other week, depending on the fertilizer being used. Stop fertilizing about 6 weeks before your first expected frost date to prevent tender new growth on the plants from being damaged by a change in weather. Choose a balanced fertilizer or one labeled for roses. Iron is especially important if the soil's pH is too high. If the leaves turn yellow with green veins, use an iron supplement. Magnesium sulfate (Epsom salt) is thought to intensify flower color and encourage flowering canes. If your soil is already high in magnesium, adding more won't help. If not, scratch in 1/4 to 1/2 cup per plant once or twice a year, and water well. As with any other type of plant, not all hybrid teas are created equal. However, the idea that hybrid teas are fussier than other rose types is unwarranted. The key, as always, is to choose a variety suited to your climate and zone. If your summers are humid, look for mildew-resistance. Where summers are dry, look for heat tolerance and vigorous root systems. Be extra certain of hardiness zone ratings if you live where winters are harsh, and provide extra winter protection. Roses with thick petals are hardier in variable weather and last longer as cut flowers. If you would prefer fewer thorns, keep an eye out for some of the thornless varieties. Most have the word "smooth" somewhere in their name. Thornless takes some of the pain out of pruning. By choosing the right hybrid tea rose for your growing conditions, starting it off well, and providing what it needs to stay healthy, you should be enjoying your roses for many years. Pruning hybrid teas is not unlike pruning other rose types. If you are regularly cutting the blossoms, you will actually have less pruning to do. Prune in early spring, before new growth. First cut out anything dead, diseased, or damaged canes as well as scrawny, spindly canes of less than 1/2 inch in diameter. Prune remaining stronger canes by about a third of their length, down to 12 to 24 inches. Hard-pruning like this encourages strong stems and large flowers. It also opens and shapes the plant so it can put more energy into fewer flowers. When cutting roses, be sure to leave a few leaves on the stem, making cuts about 1/4 inch above an outward-facing bud. Make the cuts at a 45-degree angle so that water runs off of the cut ends. What are the Most Favored Fragrant Roses?